one dish meal from me. This Sat, my girl has her tuition. My hubby and I discussed this before, and that we won't allow our kids to have tuition during weekend. As weekends are precious for that is when my hubby will make attempt to be back after his business trip. So you can imagine how precious weekends are for us as a family. Unfortunately, her school started Computer class which is compulsory for 4 consecutive Friday. Thus left with no choice at all, I had to move her Science tuition to a Sat morning. Luckily this tutor is flexible and also her classmates are nice to accommodate for this temporary change. 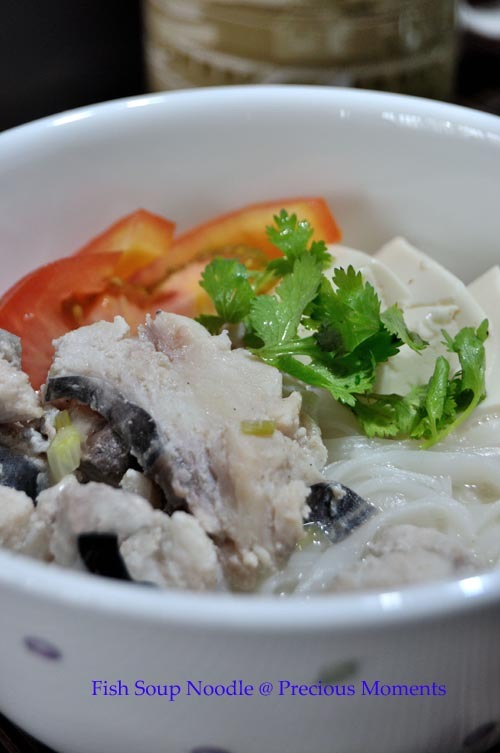 On Friday, I saw many people buying Batang fish as it was on offer, so I joined in the crowd as well, with the intention of having Fish Noodle Soup. mmmm now what is the other name for Batang? I love fish noodle soup or fish soup with rice. I found a nice stall in Kovan when my girl started her Maths tuition. Simple, healthy and yet delicious! So I wanted to replicate this at home. Another quick fixed lunch as I was able to prepare all ingredients before I left for my girl’s class. I made the stock the night before. Yes I always have prepared stock and have them freeze. It really comes in handy, be it porridge, noodle soup or a stock base for dishes. Sliced the fish and have it marinated, the rest of the ingredients are easy to put together. Another easy One Dish Meal and yummy as well! Marinate fish slices with sesame oil, pepper and soya sauce. Bring a pot of water to a boil and add in noodle. Blanched and remove. Set aside. Blanched Tofu. Set aside. You can blanch the tomatoes but I prefer raw. Bring fish stock to a brisk boil. Add in fish slices and bring to a cook. Fish will turned white. Place noodle into a bowl. Add in tofu, tomatoes and fish slices. yeah, what is batang fish? chinese name? I've never freeze my stock before but i might consider doing tha in the future for convenience. Lena, I also don't know what other name Batang fish has. Mr Pineapple you can join my family coz we love noodles! If I am not mistaken, batang fish is spanish mackeral. Most fish soup stalls use this fish. Thanks Busy Gran! No wonder i like the texture.